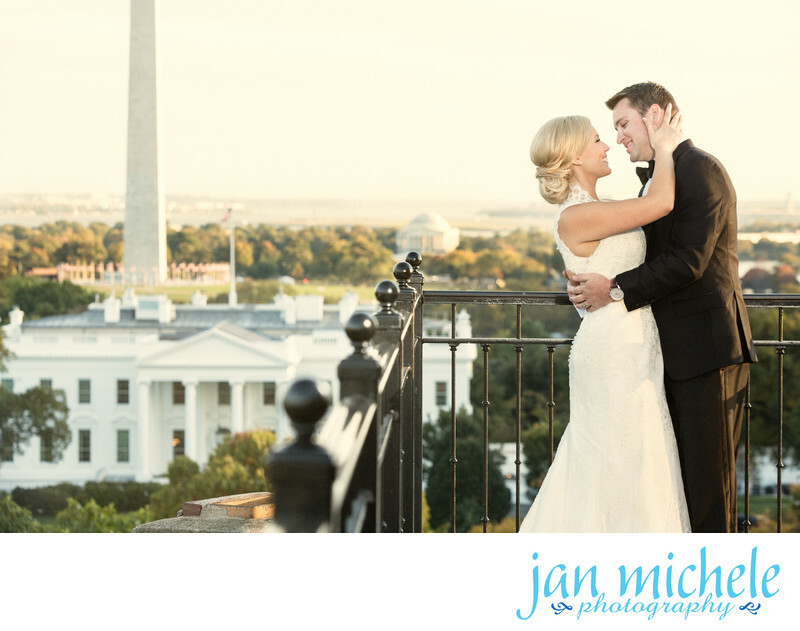 Is there any more classic wedding portrait than one with the White House, Washington Monument and Jefferson Memorial all in the background? The Hay-Adam's hotel is a beautiful wedding venue, inside and out. But nothing can beat the view from the balcony of the Hay Adams. Samantha and Nick planned a stunning black and white wedding along with a custom tux for Nick and a custom lace gown for Samantha, that matched the elegance of the location. Claudine Fay does an amazing job of wedding makeup and hair and Samantha looked picture perfect all day. Their reception was held in the Top of the Hay, a beautiful sunset lit room at the top of the Hay-Adams hotel. Walls of windows and french doors overlook the White House and classic Washington, DC monuments. Guests can enjoy views of the sunset as well as Reagan National Airport, the Air Force Memorial, Arlington Cemetery, the Potomac River and views as far as Virginia and Maryland. Service at the Hay-Adams is top-notch. Between wedding planner Amanda McCabe of Engaging Affairs and Erin Lavin at the Hay Adams, everything ran smoothly all night. The band made sure everyone danced the night away and a good time was had by all. I've photographed a number of weddings of friends and family (and their subsequent children) of Sam and Nick and I always love being invited back in to document such an important day. It's been such an honor to be trusted to create so much family history. Location: Hay-Adams Hotel, Washington, DC.